You would not believe how excited we were here at the Carriage House to find out that we had won another award. There were hoots and hollers all over the property when the phone call came in letting us know that we had won Lanier BB’s 2011 award for Best Overall Location. Woo Hoo the Crew!!! We want to give a great big THANK YOU to all of our guests who voted for us and selected us out of a field of 8,500 Bed & Breakfasts for this award. It means so much to us that our guests were the ones who nominated us and not an industry insider. Tom and I are fulfilling our dreams of being Bed & Breakfast Innkeepers and we give all that we have each and every day to make our guests feel welcome and loved while they are here. Thank you to all of our guest for loving us back! In October, we were notified by TripAdvisor that we had received the 2010 Certificate of Excellence based on our positive reviews and overall score. We have only been at this for a short time and, so for us to already be winning awards, it is just amazing to us. Truthfully, we would have been happy to just be nominated. PETALUMA, CA January 18, 2011- Congratulations to the Carriage House B&B in Jefferson, TX for having been chosen by our readers as North America’s “Best Overall Location” for 2011. We offer our readers at LanierBB.com the opportunity to vote for the Best Overall Location, tallying the total number of votes annually. Having unanimously received the greatest number of votes out of 8,500 properties by their loyal B&B guests and regular visitors to LanierBB.com, this unique B&B has earned the industry’s most prestigious award! Carriage House B&B is the ultimate bed and breakfast destination for any traveler in search of an unforgettable, unique experience. With excellent attention to detail, our member innkeepers serve their guests with extraordinary care, creating a memorable experience for travelers. Pamela Lanier’s Bed and Breakfasts, Inns and Guesthouses International has been assisting inn goers with a comprehensive variety of boutique lodgings since 1982, announcing an “Innkeeper of the Year” winner for 28 years in a row, the oldest and most prestigious B&B vote program in the world. 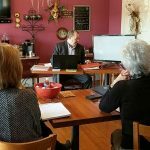 Thinking of visiting Jefferson, or want to meet these exceptional innkeepers that put their heart and soul into their B&B? Contact them today at 903-665-9511 and you’ll be received at their B&B with open arms!